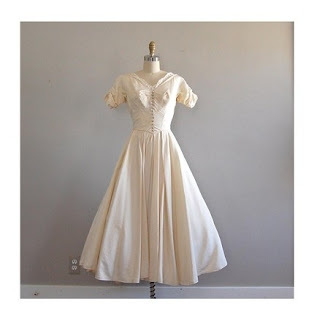 Sadie is asleep and there's a load of laundry in the washing machine and in the dryer, so there's not much more that I can do to get ready for the move until morning... which left me with a little time to look at vintage dresses on etsy. I stumbled across this one and it's absolutely beautiful! It is this week's Outfit of the Week! This shop has so many beautiful dresses! ellaOne to be approved in the US? Home Hunting- Part 5- Celebrate! Head Covering of the Week..
Two Tiny Sweaters: I'm Knitting Again! 80 Followers! For a few hours at least!